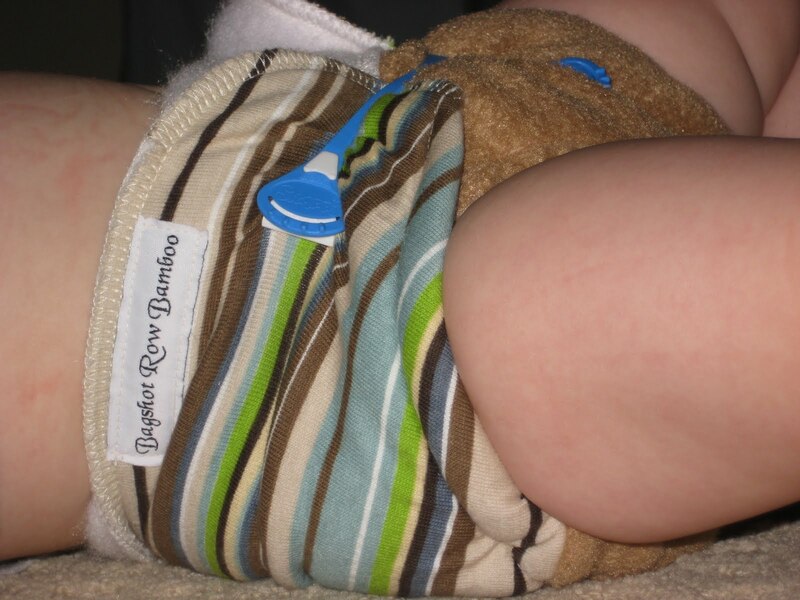 Bagshot Row Bamboo were the first bamboo snappiable/pinnable fitted diapers on the market. They’re very popular, quickly selling out after each store stocking. Like most other cloth diapers, Bagshot Row Bamboo (BSRB) diapers were created when Joyce wasn’t able to get quite the right fit with the snapping bamboo diapers she was using. Her two-part soaker was also unique at the time, though many imitations have followed. She made them extra long to allow for folding to gain more absorbency, and they were sewn in two parts for faster drying. For those of us that prefer a waterproof diaper, Joyce created the Bagshot Row Bamboo Hybrid All In One. The BSRB Hybrid AIO has two full layers of non-pill fleece, and a decorative layer of cotton knit in the outer shell of the diaper. Note that there is no PUL, so it’s a great alternative for Mamas who want a waterproof diaper, but have babies with PUL sensitivities. There is no absorbent material sewn into the shell. 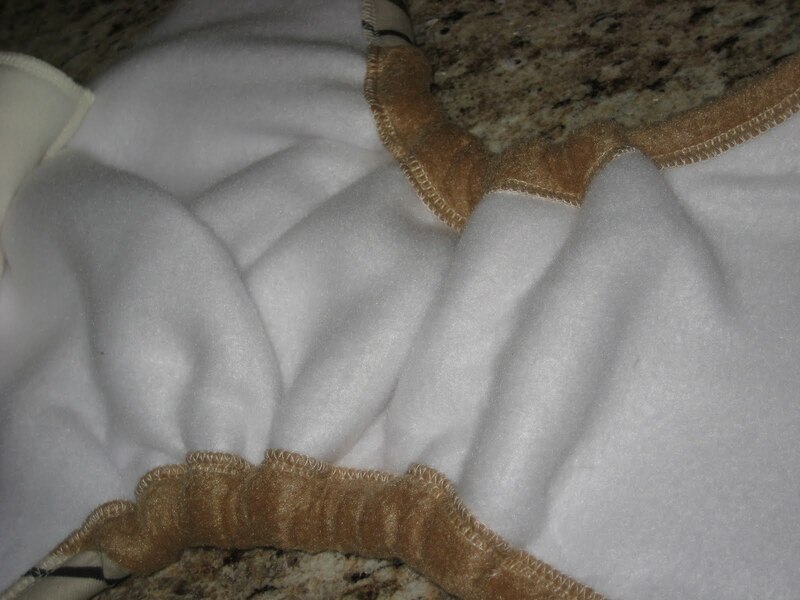 The diaper comes with a two part soaker made with bamboo/organic cotton fleece which snaps into the shell. This is what I would call an all in two. However, as I’ve discussed before, some people feel that only hybrid systems like the flip, where the shell can be wiped and reused for multiple changes, are all in twos. Anything that can only be used once before laundering (in the opinion of some) is an all in one, despite being made up of two pieces. I had no issues with wicking on this diaper, and I think that’s because the decorative cotton outer is sewn toward the back of the diaper, and not in the wet zone, where the legs would be prone to wicking. The soaker is purposely made extra-long, to allow for double, or even triple folding. If you double both soakers over, you will have 12 layers of absorbency. 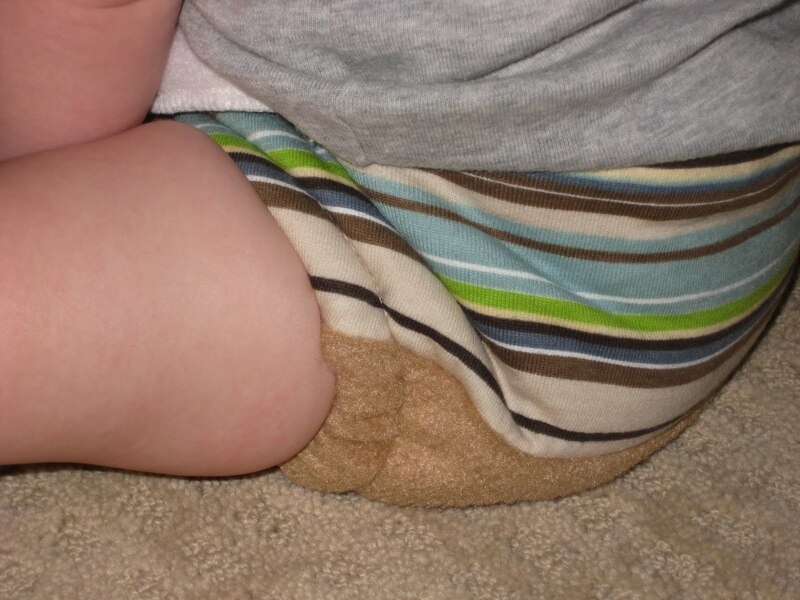 This diaper is closure-less, meaning it does not have snaps, Velcro or another closure method built in. You have to use pins or a snappi to secure it. The benefit is that you’re not constrained by rise or snap settings; the fit is infinitely adjustable. I only have one other closure-less diaper, so I’m really not the best at using snappis. I am sure if you use them more regularly, they will be easier to use. I’m getting better at it already. Even so, I still prefer snaps, and Joyce offers snaps as an option. However, they are done by another WAHM, so you would need to contact her for a quote, pay, and wait for Joyce to send your diapers to her for the addition of snaps. Not too bad for my first attempt! My subsequent attempts were better, I swear! Even though these diapers are waterproof, you should not let your baby wear them alone (no clothes) and also follow Snappi Baby’s safety instructions to NOT use a Snappi fastener on toddlers who have the ability to undo their cover and take off their diaper and/or clothes. Snappi fasteners do have somewhat sharp grippers, and the plastic tabs could potentially be chewed/choked on. The first time I used my BSRB AIO, the soakers were hardly wet when I changed it. The second time, he pooped in it immediately (soakers didn’t stain at all by the way.) So, the third time, I purposely left it on him longer than usual, so I could really test the absorbency. I was quite surprised when I realized I could have left it on him even longer still! There was no leaking, no wicking, and the soakers had tons of absorbency left. They weren’t even fully saturated. If you want your own Bagshot Row Bamboo Hybrid AIO, you’ll have to stalk her Hyenacart store. She stocks each Friday at 4 and 6 P.M. central time. Her diapers sell for $20-$25 depending on style. Or, you can win one! 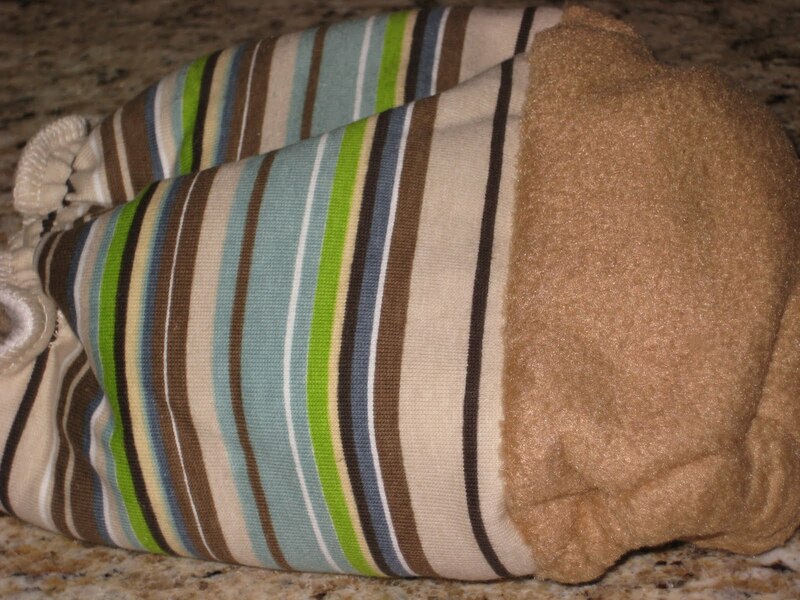 Joyce will make one lucky blog reader a BSRB diaper in their choice of style and print! Here’s how to enter: The first entry is mandatory, the rest are optional. You may do as few or as many as you like. Leave a separate comment for each entry. Please make sure to include your email address in at least one comment, if it isn’t viewable in your profile. Giveaway is open to residents of the U.S. only. 1. Visit Bagshot Row Bamboo’s Store and tell me what style and print you would choose if you won. If there isn’t much in the store, you can see the items that will be stocked shortly here. 3. “Like” me on Facebook. I will accept entries until Thursday, June 24th, 2010 at 9 P.M., Eastern. I’ll select a winner using random.org’s true random number generator, and notify him/her by email. The winner will have 48 hours to respond before the prize is forfeited and another winner is chosen. Bagshot Row Bamboo provided a diaper to me at no charge, for the purpose of reviewing it. No monetary compensation was given and all opinions are honest and my own. BSRB also will provide a diaper to one blog reader at no charge. Thank you BSRB! >Boy oh boy, what one I would like??? I guess the Chicks Dig me AIO. It's wicked cute!!! >I’m a Facebook Fan Jennifer G.
>Oh, wow! I love her green and grey argyle print. >I now follow your blog. >I "liked" you on Facebook. >I love the Chocolate Cherries print for an AIO. >I LOVE the superhero with stripes hybrid! Too Cute! >I follow your blog w Google Reader! >I would love to have the the Blue Tye Dye AIO. >Love the stars and stipes diaper! >I think the The Bagshot Row Bamboo All In One (Hybrid)– Patriotic is adorable! >The Bagshot Row Bamboo All In One (Hybrid)–Stars and Stripes- my family and I are colonial reenactors and this would be perfect for our event on the fourth of july! or year round to show our patriotism. >I "like" you on Facebook.sandicriswell@yahoo.comThanks! >Groovy Guitars AIO. So cute!sandicriswell@yahoo.comThanks! >If I had to choose just one it would be the AIO Hybrid in Sassy Tink! >I would choose an AIO, and The patriotic ruffles! Too cute!!! >I would love a Surfboards Hybrid!! >beautyformyashes@hotmail.comI would choose All In One (Hybrid)–Multicolored Birds! >I'd choose the Ultimate Fit AIO in Superheroes! >I would love an AIO in Dino Stripes for my little men! 🙂 SO cute!!! >I like the hybrid diaper, and the let's play hockey print! >Tucked in all night – WOULD LOVE IT!!!! >I am also following your blog, twitter, and liked you on facebook! >I love the all in one hybrid purple stripes. >I'd get a AI2 viking ship I loooove the viking print it's too cute! >awwww I like the Chocolate Safari print. >I'm now following your blog! >I liked you on facebook. Erika F.
>I love the AIO Multicolored birds and the Sunny Flower. I can't decide which I like better. >Chicks rule! Totally! AIO hybrid! >I love the surfboards AIO hybrid!